What is it we are doing? • Three Square Market (32M) is offering implanted chip technology to all employees. • Company employees will have the option to voluntarily implant a RFID micro chip between the thumb and forefinger underneath the skin. • RFID technology or Radio-Frequency Identification uses electromagnetic fields to identify electronically stored information. • The RFID chip will allow employees to make purchases in the company’s break room market, open doors, login to computers, use copy machines, among other things. • As with a proximity card, the chip implant works in a similar fashion – by holding the chip up to the device reader, the unique serial number associates the user with the software, the software then performs the requested function. • For employees interested in the technology, but not the implant, they can place the microchip in a RFID wristband or a RFID/Near-Field Communication Smart Ring. • Three Square Market’s partnership with Biohax Sweden is focused on privacy & integrity, ethical development, and sustainability. • The chip is not trackable and only contains information you choose to associate with it. This chip does not have GPS capabilities. • RFID readers are proximity readers and can only be read with a few inches of an appropriate device. • The implant uses near-field communication (NFC); the same technology used in contactless credit cards and mobile payments. How safe is the chip? • Will the device will harm your body? This device is FDA approved dating back to 2004. The device is only inserted through licensed professionals. The device is easily removed, similar to a splinter. The data on the chip is encrypted, like the technology used in a credit card. RIVER FALLS, Wis. – July 20, 2017 – PRLog — Three Square Market (32M) is offering implanted chip technology to all of their employees on August 1st, 2017. Employees will be implanted with a RFID chip allowing them to make purchases in their break room micro market, open doors, login to computers, use the copy machine, etc. This program, offered by 32M, is optional for all employees. The company is expecting over 50 staff members to be voluntarily chipped. 32M is partnering with BioHax International and Jowan Osterland, CEO, based out of Sweden. RFID technology or Radio-Frequency Identification uses electromagnetic fields to identify electronically stored information. Often referred to as “chip” technology, this option has become very popular in the European marketplace. The chip implant uses near-field communications (NFC); the same technology used in contactless credit cards and mobile payments. A chip is implanted between the thumb and forefinger underneath the skin within seconds. “We foresee the use of RFID technology to drive everything from making purchases in our office break room market, opening doors, use of copy machines, logging into our office computers, unlocking phones, sharing business cards, storing medical/health information, and used as payment at other RFID terminals. Eventually, this technology will become standardized allowing you to use this as your passport, public transit, all purchasing opportunities, etc.” commented 32M CEO, Todd Westby. “When working with our operators over in Europe, we came across a company of chipped employees at BioHax International and the concept of using RFID with micro markets quickly grew,” commented 32M VP of International Sales, Tony Danna. “We see chip technology as the next evolution in payment systems, much like micro markets have steadily replaced vending machines. 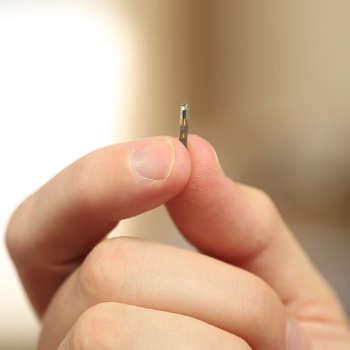 As a leader in micro market technology, it is important that 32M continues leading the way with advancements such as chip implants” added Mr. Westby. 32M is envisioning this technology to help it grow its other self-checkout businesses. “We see this as another payment and identification option that not only can be used in our markets but our other self-checkout / self-service applications that we are now deploying which include convenience stores and fitness centers,” added Mr. McMullan. Employees will be chipped at the 32M inaugural “chip party” hosted at their headquarters in River Falls, WI on August 1, 2017. 32M based in River Falls, WI, is considered a leader in micro market technology. With its’ patented technology and industry-leading smart phone application and inventory intelligence, 32M has grown to over 2,000 kiosks in operation in nearly 20 different countries plus it operates over 6,000 kiosks in its’ corrections industry business, TurnKey Corrections. For more information on 32M visit http://www.32Market.com or http://www.BreakRoomRehab.com or follow them on Twitter, @32Market, on Facebook, Instagram or LinkedIn by typing in 32Market. BioHax International is a company based in Sweden on the forefront of implanted chip technology. Osterland was recently a guest speaker on the TED Talks. Visit http://www.BioHaxSweden.com for additional information. 32M is inviting the press to attended and partake in the event on August 1st, 2017 at 11 AM CST in River Falls, WI for more information please contact 32M directly. What is Pick & Ship? Pick & Ship is a unique feature of the 32M system, that you won’t find anywhere else. Using 32M’s Intelligent Inventory Management and your set route schedule, orders can be auto-generated to OUR warehouse … where your products are picked per store, boxed, and then shipped to YOUR selected location. Just the products you need. Delivered to your location! Why Use Pick & Ship? For all the reasons listed above, with 32M’s Pick & Ship concept you can cut paid employee time, warehouse and vehicle costs. Your agreement with 32M will determine your price level, etc. Stock your shelves and enjoy the rest of your day! Get started today by contacting your salesperson! Why 32M? Well to be honest on this topic we could go on for days … But we won’t! Your transactions are safe with us! Something we are super proud of is the time and effort we have put in to hold the highest level of PCI and PA-DSS certification in the industry. That’s right the HIGHEST LEVEL! What do PCI and PA-DSS mean? Payment Card Industry Data Security Standard (PCI DSS) is the set of rules established by the Payment Card Industry to protect cardholder information. PA-DSS was implemented in an effort to provide the definitive data standard for software vendors that develop payment applications. The standard aims to prevent developed payment applications for third parties from storing prohibited secure data including magnetic stripe, CVV2, or PIN. In that process, the standard also dictates that software vendors develop payment applications that are compliant with the Payment Card Industry Data Security Standards (PCI DSS). Do small businesses need to be PCI Compliant? PCI applies to all merchants who process credit or debit card transactions regardless of the size or number of transactions. Merchants must be able to demonstrate PCI compliance across all IT systems that store, transmit, or track cardholder data. What’s the benefit of being PCI Compliant? By making sure your business is PCI Compliant, you protect your customers’ personal data from breaches, prevent against unscheduled business downtime and ensure that customers trust your brand. Want to learn more about 32M and what we can do for you? Call our reliable sales staff below!